Will the Real Dvorak Please Stand Up! 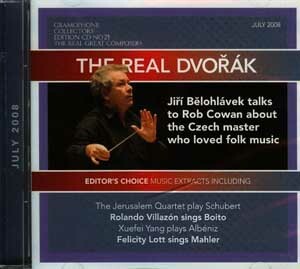 Reader and Twitterer Jeff Szer points out that the latest disc that comes with Gramophone Magazine highlights my Twitter name THErealDVORAK. I thought it was amusing anyway. Its nice a magazine called “Gramophone” has an Ipod cast to go with it? The Feature article about “Chamber Rock” I think is instructive. I like the Classics, and I like early 70’s “Orchestral Rock” like Yes, Pink Floyd etc. Pop tunes played by London Philharmonic are also nice. Not too much of that going on today but forming a bridge and introducing both sides to the other is a good thing. It actually doesn’t matter what you like as long as you like something? John, did you ever spell your name with the caron and acute accent? Take heart, you can still be The American Real Dvorak. I think we all know which Dvorak is crankier! 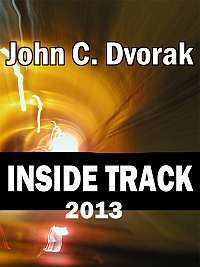 You have to pronounce dvorjak for the composer, do you say John C. Dvorjak or John C. Dvorak ? Highaman is right. Because the name comes somewhere from Eastern Europe. If you are to buy link, contact. Living in Prague John I am reminded of you constantly with the thousands of signs for Dvorak. 🙂 The pronunciation is different of course but still. If you ever visit John let me know I can show you around one of the must beautiful cities in the world. I bet the inventor of the Dvorak computer keyboard is feeling left out of this. And every day John C. Qwerty just gets richer and richer, and every night he parties with strippers and tequila. John C., wasn’t it your dad who invented that keyboard?